Micro mosaic gold brooch with filigrain by Castellani: Description by Adin Antique Jewelry. As with this 18K yellow gold Victorian brooch, the Italian jewellery brand "Castellani" is a master in towing anyone along to an ancient place where time stood still. The white with blue centre is of exquisite detailed micro mosaic, composed in small square pieces of enamel threads -also called "smalti falti" in Italian. Various gold filigree patterns beam from around the archaic middle. In any means, the letters EY stand for a gesture of caress whether in Greek "Good Health" or in English "Eternally Yours". Style specifics: The Grand Victorian Period - Experts divide the reign of Queen Victoria, also called The Victorian era (1837-1901) into three periods of about twenty years each; The Romantic Victorian Period (1837 - 1860), The Grand Victorian Period (1860 - 1880), and the Late or Aesthetic Victorian Period (1880 – 1901). Theme: EY - Although not obvious on first sight, these are not Latin but Greek letters. The letters EY stand for "good health" but one could also say it's the abbreviation for "Eternally Yours". A "micro mosaic object" is a decorative object or architectural element made from relatively uniformly sized pieces of hard substances fitted together and embedded in a matrix of some adhesive or bonding substance that eventually hardens to hold the pieces in place. The word derives from the Greek word for the Muses, implying it is a form of artistic expression. SMALTI FILATI: Filati means "thread" in Italian. Smalti filati literally means thread tesserae. The opaque enamel is heated and pulled out to make long thin strands shaped similar to spaghetti or linguini. These are then broken into shorter pieces called tesserae. These originated about mid 18th century at the Vatican Mosaic Workshops. Smalti - Flat rectilinear tesserae made by pouring molten opaque colored enamel onto a steel slab, allowing it to cool, and then cutting it into small flat or cubed pieces called tesserae. The smalti are composed of silica, an alkaline substance such as soda or potash, lead, metal oxide coloring agents, and tin oxide for opacity. Opaque tesserae were desirable to avoid a shiny reflective surface when using mosaics as copies of paintings in St. Peter’s Basilica. Smalti means “enamels”(smalto means enamel) in Italian, but used in English as a singular term, enamel. We say micromosaics are made of enamel, not "enamels". Support - The supportive backing for the mosaic, its material depending on the size of the art work. In small pieces such as jewelry, the backing was made of a metal such as a copper tray with a rim, or of glass, goldstone, or small plaques of marble, which were hollowed out to the proper depth to hold the mosaic. For larger scale pictures, the weight necessitated use of slate or marble, similarly hollowed out, or iron surrounded by a rim. Take a look at the picture with the ruler in which we took a close up to show you the incredible degree of excellence of this micro mosaic. Extra information on Castellani - Fortunato Pio Castellani (6 May 1794 - 1 January 1865) was a 19th century Italian jeweller and founder of Castellani, an Italian jewellery company. 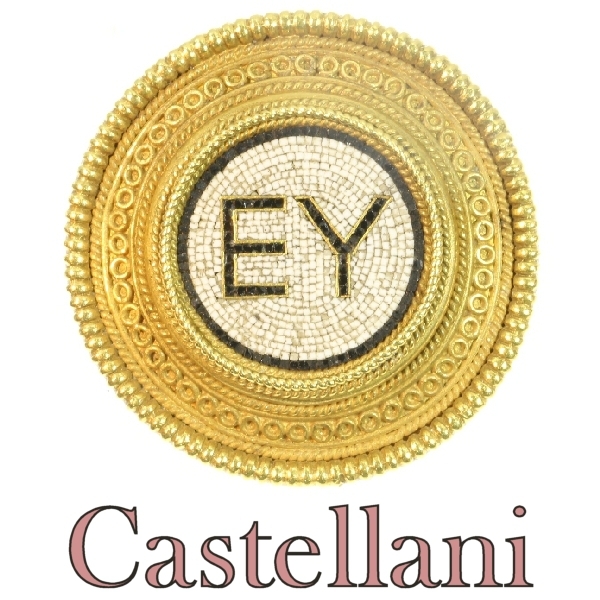 Castellani opened his first shop in Rome in 1814. He specialised in recreating the jewellery of ancient craftsmen, particularly the Etruscans. Castellani based many of his designs directly on archaeological evidence and often incorporated intaglios, cameos and micromosaics into his jewellery. His work became very fashionable throughout 19th century Europe and his shop was frequented by grand tourists and aristocracy. The Castellani dynasty spanned three generations, and were also noted antiquarians. In 1836, archaelologists discovered the Regolini-Galassi tomb, a particularly important Estruscan find that yielded a large amount of beautifully preserved jewellery. Because of his expertise in the field and his connections with Caetani, Castellani was enlisted as an advisor on the excavation. Much of the jewellery excavated was decorated with granulation - tiny specks of gold applied to the surface. This technique was unknown to 19th century jewellers and Castellani was inspired by the discoveries to rediscover the lost art. In the 1850s, Castellani passed management of the family business to his two sons Alessandro (1824–83) and Augusto (1829–1914) in whose hands it continued to flourish. The family were keen collectors and in addition to their jewellery business they dealt and restored antiquities extensively. Castellani's main shop was immediately adjacent to the Trevi Fountain - one of Rome's most prestigious locations - and incorporated a museum of the family's collection.